Salads have undergone a revolution during the last decade. Gone are the days of mass-produced iceberg lettuces and under-ripe, floury-textured, tasteless tomatoes in cold, limp, over-vinegared salads. Nowadays people want great quality ingredients, produced on real farms close to home, not the huge industrial units that wage a relentless chemical war on nature. Salads today are fresh and diverse and crunchy, with exciting tangy dressings, and moreish additions such as cheese, nuts, herbs and grains. More than ever the links are understood between a healthy, nutritious diet and bodily health (and beauty). Food that is replete with natural oils and fats, cleansing spices, and high in fiber has never been more popular. And out with gross, empty 1980 and 90s ‘low fat’ foods. There’s nothing more fun than creating a salad – starting with a blank canvass, playing around with the texture, the colour and deciding whether to make it hot vs cold. We are constantly coming up with new salads for the fashion set, delicious and new recipes that keep them going on long hard days on set.. as we know they don’t live on air and fags! The dressing is where it gets exciting. The dressing is the key; getting that right brings a moment of triumph. We love nothing more than coming up with new and delicious dressings – as in George’s Marvelous Medicine, creating your own magic potion which brings your vibrant, delicious salad to life. In London restaurants today, salads are not merely side dishes, an after-thought, but main courses in their own right. 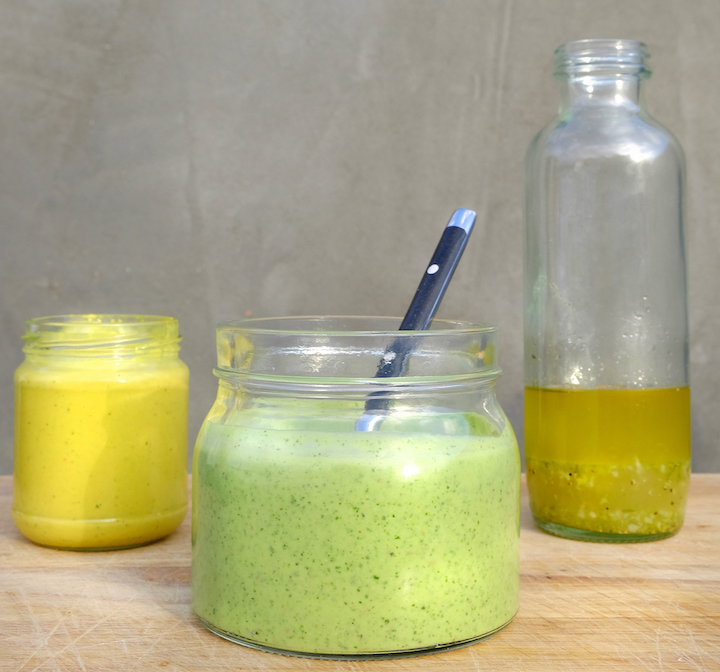 These are 3 favorite dressings of ours, interestingly all with lime juice- a tangy, gingery tahini dressing- which is ideal for Asian inspired salads where you can keep on adding (grilled chicken, rice noodles); feta, yoghurt and coriander dressing- with its middle eastern favours, we find ourselves making extra so we can dip our veggies into it all week long; and finally a good old class smoked garlic, extra virgin olive oil, and lime dressing- delicious with crunchy lettuce, goats cheese and toasted nuts. bunch coriander , parsley and chives.